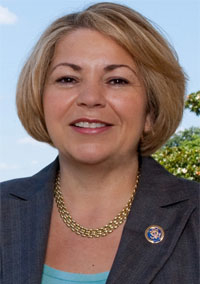 Rep. Linda Sanchez (D-Calif.) has introduced legislation to improve the workforce conditions of home-care providers while taking steps to recruit more people to the profession. The Direct Care Workforce Empowerment Act aims to extend wage and overtime protections provided by the current fair labor statute to home-care workers, said Sanchez, a member of the House Ways and Means Committee, at a news briefing in Washington. The new legislation also seeks to improve data collection and workforce monitoring, and also boost direct-care workforce recruitment and retention by providing $25 million in grants to states each year for five years to train more direct-care workers. More than 13 million elderly and individuals living with disabilities rely on direct-care workers, which may include home-care aides, personal-care attendants, personal assistants, nursing assistants and direct support professionals, according to the Direct Care Alliance, based in New York. Historically, this workforce has been denied basic labor protections under the Fair Labor Standards Act. According to the alliance, most of these workers receive low wages, few or no benefits and insufficient training, which compromises the quality of care for the patients they serve.